At first, I prepared all my die cuts: 3x the second largest rectangle from the 'stitched rectangle' dies from pattern paper and vellum and 6x snowy hills using the 'landscape trio' die from Mama Elephant. Then I stamped and colored in 6 bunnies from the set using Copic markers. I don't have the dies for this set so I had to handcut all of them. I also prepared the trees by using both inks, freshly cut grass and noble fir, at the same time in order to get kind of an ombre effect and cut them out. I used the heart and the bird which are included in the set too. Now I had to assemble all these pieces but that's one of the fun parts :-) I added the sentiments with lobster ink from Lawn Fawn directly to the vellum piece, so it matches the red heart or bird. I scattered some sequins and used my Wink of Stella clear glitter pen on the heart and bird. Last but not least I adhered the scene to a woodgrain notecard from Lawn Fawn which I haven't used for a while too. 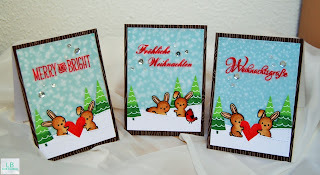 I also used the noble fir ink pad and the brown woodgrain notecards from Lawnfawn. 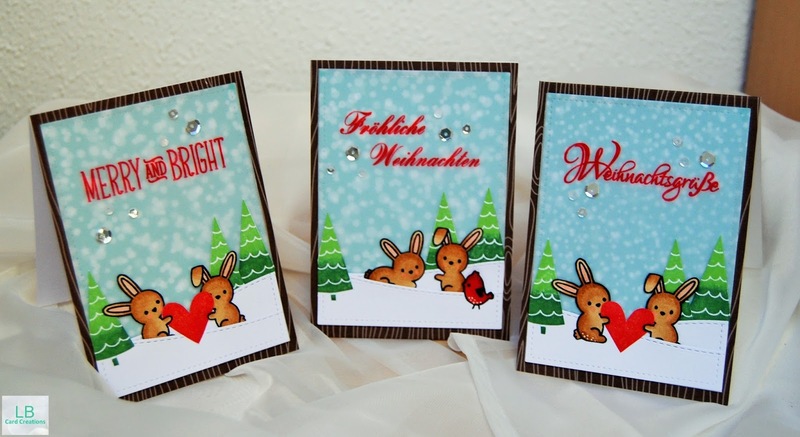 A beautiful trio of Christmas cards! Love the sweet scenes on them.